With all the rain we’ve been having in the UK I can’t see me featuring an outfit post without a raincoat or trench coat for a while – it’s been torrential! This was a weekend outfit that started off as just straightforward double denim: nice and easy and a bit of a no-brainer. My vintage Eiffel tower scarf added some colour (and matched my nails, but that was just coincidence), and I wore my short trench which is pretty voluminous but I just love the graphic black edging. These were taken shortly after another downpour, so I was lucky to only have to battle with the wind in the end. However, rain sometimes presents a challenge to us bloggers when we have to get outfit photos taken, so how about some ideas to help you get round the problem? Come back in a couple of days for a Photo Tips Friday post with tips on how to photograph outfits in the rain – don’t miss it! I so need a new trench. I like this shorter length! Are those shoes suede? Don't let anyone step on your blue suede shoes! Looking perfect as ever. We have had beautiful weather last week in Holland. But that has ended now….. oh dear. As temperature is dropping as well, I am afraid I will need more than a trench coat. Lovely outfit with all that blue.Though I feel cold when I look at your bare feet. 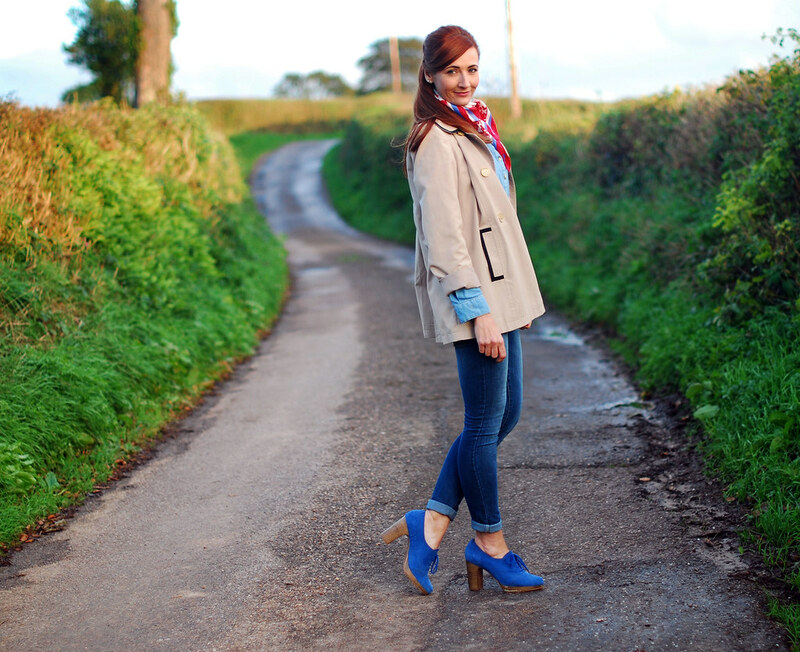 Love the pop of blue in the shoes and that trench coat is too cute! first of all, i LOVE your hair! it's so gorgeous. and all that rain sounds awful- though you still look super chic during it. 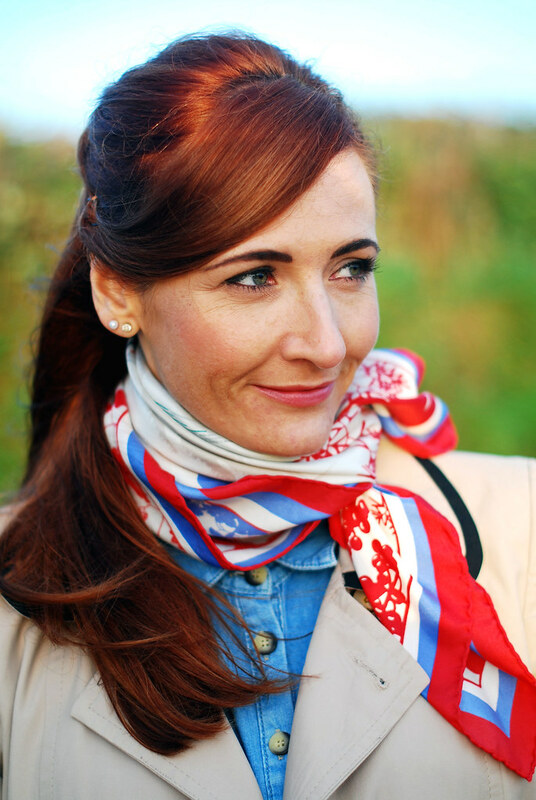 i love denim on denim, and that vintage scarf was the perfect finishing touch. i totally want to steal this outfit, haha! PS- I'm popping in from the three-fer thursday linkup! Dropping by from the Three-fer Thursday Linkup! Those shoes are amazing! Looking forward to your photo tips! This is such a fabulous look on you! And I love those blue shoes, too cute!! Thanks for sharing your look with Three-fer Thursday! I absolutely love that scarf, and the colours around you are so beautiful after the rain. Popping by from the linky over at Kiwi Women's Style. Have a great weekend! This is so cute, but for me the shoes just make the whole thing! Great colors! Although we've been really lucky so far this season, Vancouver (Canada) is also known for it's long, wet winters…so yes, please!! I am looking forward to your tips!! Your style is impeccable! Been following you for a few months. Love the Shoes. A beige trenchcoat is my autumn uniform too. Your shoes are a great option for this season in between pumps and booties! I am really looking forward to your photo tips. 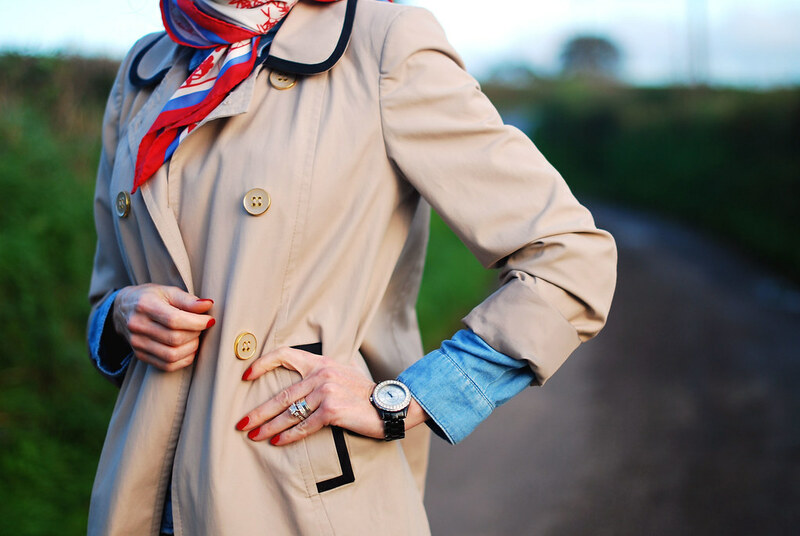 Cute trench…love how you styled it, Catherine! This look is truly beautiful! Love the pop of blue shoes!